U Pavé diamond bands are our most popular style! This contemporary style is the perfect blend of secure side stones and brilliant sparkle. 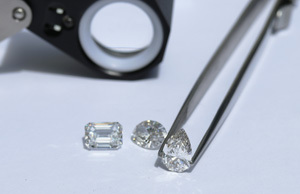 The name “U Pavé comes from the distinctive u shaped grooves visible from the side of the pavé. Our French Pavé styles can be described as having a more angular or “w” shaped look than our U pavé setting style. This style is sometimes referred to as “Fish Tail Pavé”. Our Channel Setting style is a great fit for those who are very hard on their jewelry and want a rail of secure metal surrounding the stones. Our Split Shank Setting features a contemporary look with exceptional sparkle. This diamond band style is a great way to make a ring take up more of your finger, which can make your center diamond appear look larger. The overlapping bands of metal and manmade diamonds in our Infinity Twist setting provide the perfect balance of unique style and classic feel. An elegant modern style, our diamond band rings featuring dainty micro pave are best suited for those who are very gentle with their jewelry.